Let’s talk health. We’ve been watching a lot of reportages on food and health lately, and it’s quite an eye-opener. We regularly read natural medicine articles as well, giving us tips and advices regarding proper diet and natural ways to stay healthy and prevent health-related problems. It’s all fascinating and quite empowering to discover and learn all these amazing things nature can offer us for a strong and resilient body and mind. This fascination must come from the age. After all, the most genuine sign of aging, dare I say maturity, is the real concern and interest in preserving our body, in becoming fit and healthy. We all seem oblivious to health problems and feel somehow invincible when we were younger, weren’t we? All those fast food or instant noodles we used to gobble seemed normal and harmless. Those nights we felt young and wild literally drinking litres of different kinds of alcohol as if there’s no tomorrow felt awesome. Those days when cereals for dinner sounded like a decent meal, or a chocolate buffet appeared to be a genius idea. Seriously, all these would’ve been normal, mundane and nothing to think about. And then you turn 30. Your digestion seem to have started a mini revolution inside you making all the greasy fries or kebab (or both together – uh huh) one of the greatest regrets you’ve had. The morning after a night of binge-drinking becomes insufferable and you make that mental note NOT to ingest alcohol ever again. The idea of buffet or eat-all-you-can’s makes you upset and nauseous. It just simply isn’t possible to eat more than one platter of tempura by yourself. Hell freaking no. So yeah, the invincible young version of you is now the legend in your back-in-the-day stories. What’s left is the sage version of you reading health magazines and fitness blogs, food shopping in the fruit and veggie aisles. This more sensible self you have now can still enjoy all sorts of cuisine as elusive as that may sound. It all boils down to the fun and exciting concoctions and food experiments you manage to dish out. For instance, noodle and grain bowls. 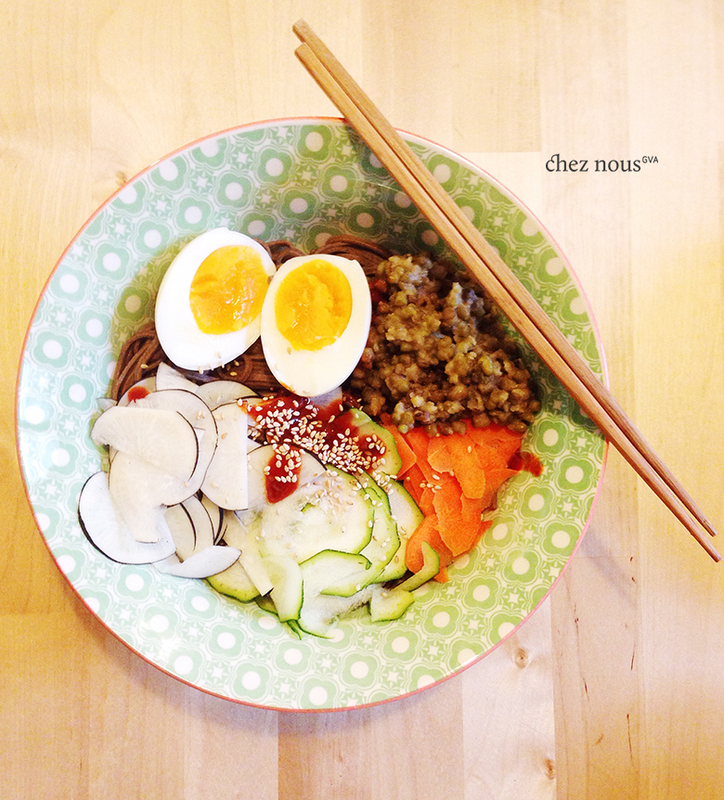 I love noodle, rice and grain bowls! LOVE. It doesn’t take so much time and effort to prep them, and it doesn’t take time and effort neither to clean one up with your appetite! 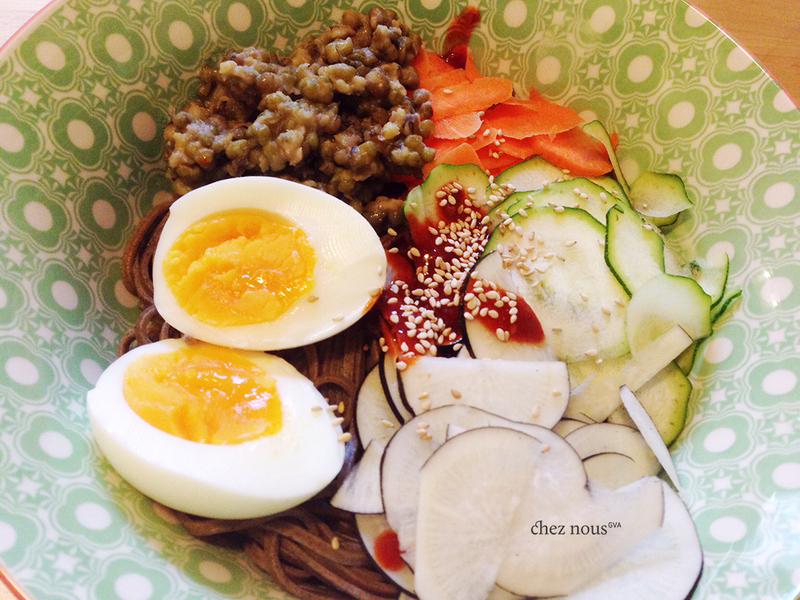 Cook the buckwheat soba in boiling salted water for 6-8 minutes (check the packaging of your noodles to be precise). Drain when noodles are al dente. Divide the noodles into 2 big bowls. You can drizzle a bit of sesame or extra virgin olive oil over the soba so they won’t stick up together. For the sauce, mix together the Gochujang, vinegar, and sesame oil. Crack some salt and pepper and mix some more. And that’s it! Now for the bowling. Simply divide the vegetables into 2 portions and top the 2 noodle bowls with these. To add flavor to the veggies, you can pickle the radish in rice vinegar, salt, pepper and a bit of sugar at least a few minutes in advance. We used fresh radish for this one though! Add half of the mung beans on top of each bowl. Cut up those soft-boiled eggs into 2 and add to the toppings. Finally, pour half of the sauce in the center and sprinkle with sesame seeds. Bon appetit! If you are not fond of purely veggie bowls, just top off with grilled or steamed chicken breast or mackarel or salmon slices. More noodle and grain bowls soon! Stay fit and healthy, folks! ← Korean pancakes and some kimchi, please.